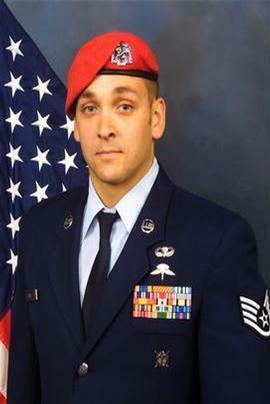 Assigned to the 24th Special Tactics Squadron, Pope Field, North Carolina, Andrew Harvell, 26, was a combat controller whose job was to deploy undetected personnel into hostile environments to establish assault zones and conduct air traffic control at forward airfields while simultaneously conducting command of close air support. His unit is famous for being one of the most highly trained special operation forces in the U.S. military. On August 6, 2011 in the Tanji Valley, Wardak Province of Afghanistan, Harvell suffered fatal wounds when the CH-47 Chinook helicopter in which he was traveling was shot down by insurgent air fire during a night raid. Those who served with Harvell remember him as one who could put combat mission pilots at ease with a smooth tone and confident manner to his voice. The Long Beach, California native is buried in Los Angeles National Cemetery. He is survived by his wife, Krista, and two sons, both of whom are Folds of Honor scholarship recipients.